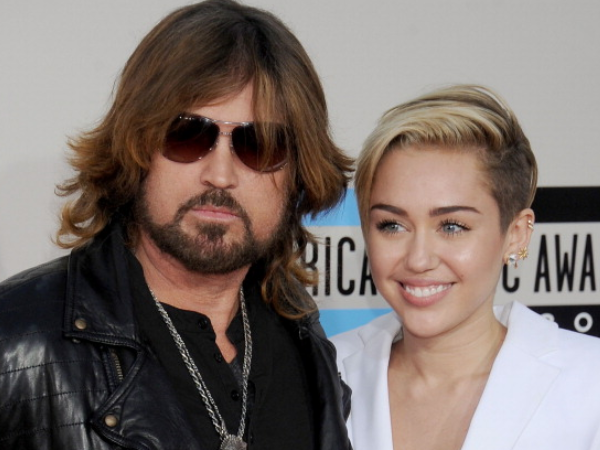 Miley Cyrus' father wouldn't be surprised if she collaborates with Caitlyn Jenner. The singer hinted she's working on something with the former Olympic athlete, who recently revealed her transition from male to female, via a cryptic post on her Instagram page. On the social networking site she uploaded an arty version of Caitlyn's famous Vanity Fair cover, captioning it: "Werk in progress #dirtyhippieXhappyhippie #callmecaitlyn (sic)"
And her dad Billy Ray wouldn't bat an eyelid if the controversial 22-year-old was getting involved in exciting new projects. "She’s always getting into something new," he told ET Online. "I wouldn’t be surprised at all." Billy Ray and Miley's older sister Brandi attended the CMT Awards in Nashville last night, where they also commented on Miley's recent Paper magazine shoot. On the cover, Miley can be seen posing naked with her pet pig covering her modesty. "Anytime she can show her animals off, you know, she loves that," Brandi smiled. In the accompanying interview, Miley opened up about her sexual preferences. It's not the first time she's discussed her approach to dating and she was just as candid this time.